Winston-Salem is known as the City of Arts and Innovation. We have a vibrant arts scene, centralized in the Arts District of downtown, radiating from Trade Street. Enjoy the rich creative local talent as well as national and international artists at the variety of Winston-Salem art galleries. The First Friday of each month, the Arts District celebrates with First Friday Gallery Hop from 7-10pm. 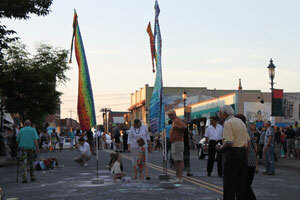 During Gallery Hop, Trade Street is blocked off for a few blocks to open the way for sidewalk chalk art in the street, belly dancers, buskers, and other performers. Galleries feature new exhibits, some offering refreshments, workshops, or special events that evening and there is often a drum circle at Golden Flower Center open for all to join in. ArtConnections is a cooperative of local artists located on Trade Street in the Arts District of downtown whose work includes bookbinding, collage, drawing, marbling, mixed media, printmaking, upcycled clothing, classes and more. Open since 1984, Artworks Gallery is a co-op gallery run by artists and features local artists of all media. A Studio at 625 Trade St.
Center City Frame Gallery (CCFG) exhibits signed and numbered framed prints and original art by North Carolina artists. CCFG offers conservation and archival framing with a wide selection of framing to choose from. One-day service available. Delurk Gallery is a co-op gallery featuring several local artists and also serves as a satellite studio for the international Art-O-Mat project. Fiber Company is a working weaving studio featuring hand-woven clothing, accessories and home goods by the owned by exhibiting partners Dee Conner, B. Jane Doub, Kathryn Gauldin, Carolyn Glazener, and Olivia Camden Mackie, as well as jewelry, woodwork, pottery and photography on consignment from local crafters. A full-service hair salon as well as a gallery featuring a new artist each month. Piedmont Craftsmen, Inc., is a crafters and artists guild created in 1963. Dedicated to fine traditional and contemporary arts, Piedmont Craftsmen, Inc. represents almost 400 of the most talented artists and crafters in the Southeast. Besides the year-round gallery space, they also host the huge annual two-day Piedmont Craftsmen Fair at the Benton Convention Center in November. Artists Ron and Tamara Propst opened The Other Half gallery to feature Ron’s amazing pottery, as well as paintings and fine crafts in clay, glass, metal, wood, and designed commercial works. The gallery features artists exhibits throughout the year and also takes commissions. 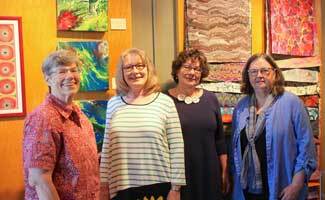 Home of the Art for Arts Sake non-profit group, Red Dog Gallery showcases the work of a consortium of talented local artists, photographers and craftsmen. From paintings and raku pottery to handmade jewelry and whimsical sculpture, the items on display at the gallery are constantly changing – and there always is something new to discover for every sensibility and budget. Visual Index (VI) is an independent gallery featuring contemporary craft and fine art with mediums spanning clay, jewelry, glass, 2D works and more. VI strives to support living artists and make art more approachable. Their vision is to carry at least one artist from each state and they currently represent 20 states and 73 artists. Just a few blocks away from the Arts District, the Milton Rhodes Center for the Arts hosts the Associated Artists of Winston-Salem gallery of local visual artists encouraging them to develop as professional artists in their media. Located on Reynolda Road on the edge of downtown Winston-Salem across from the main entrance of Hanes Park, Fourth Street Art & Frame is a custom frame shop and storefront gallery featuring original art by Winston-Salem and other North Carolina artists. The Museum of Early Southern Decorative Arts (MESDA) opened in beautiful Old Salem in 1965, (walking distance from the Downtown Arts District). It showcases a wide collection of decorative art and craftsmanship of the Southern lifestyle of 18th and 19th century settlers, including architecture, ceramics, furniture, needlework, paintings, prints and more. A guided tour is included with entry. 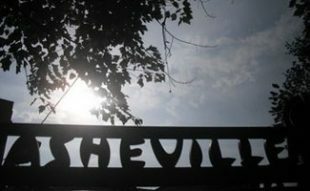 The 45-minute tours give an intimate look at the lifestyle and places of early settlers through their craftsmanship and take place every hour on the hour. Additional focus tours, and one- and two-hour study tours available at additional fee and reservations are required. Tickets are available for purchase online, as well as in-person at the Frank L. Horton Museum Center and the Old Salem Visitor Center. 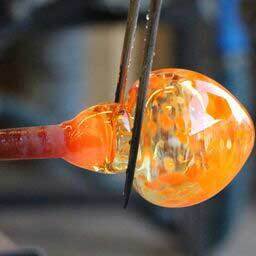 The Olio is a non-profit art glass gallery, and a working glassblowing studio featuring workshops, an apprentice program and educational outreach. The Davis Gallery showcases exhibits related to the programming of Sawtooth School for Visual Art, and often features the work of talented faculty members, as well as an annual student exhibit. Groups of six or more should be arranged in advance with the Gallery. The Womble Carlyle Gallery hosts rotating exhibitions featuring local, regional and national artists. The Charlotte and Philip Hanes Art Gallery is focused on presenting challenging and engaging artwork; mostly contemporary, but sometimes focused on historical works or selections from the breadth of Wake Forest University’s collections. Through 6-8 exhibitions a year, the Hanes Gallery’s goal is to encourage a direct and involving experience with the artwork. 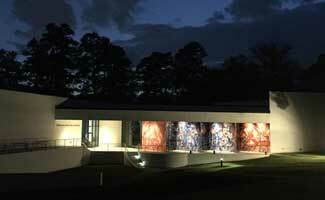 The Gallery is closed during Wake Forest University student holidays. A gallery located on the campus of Winston-Salem State University showcasing paintings, prints and sculpture of Africa and African Americans. Distinguished by The Smithsonian as one of the nation’s best regional facilities for exploring contemporary African art. 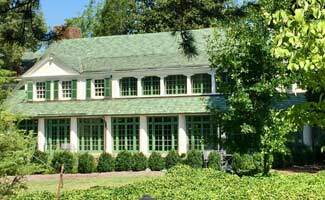 Reynolda House was built in 1917 by Katharine Smith Reynolds and her husband R. J. Reynolds, the founder of R. J. Reynolds Tobacco Company. In 1975, the hose was opened to the public as an organization dedicated to American art and education. The Reynolda House Museum of American Art exhibits a premiere collection of American art from the colonial period to the present. SECCA opened as a non-profit visual arts center n 1956. The Center is part English Hunt-style mansion, willed to SECCA by industrialist James G. Hanes in 1972, and part modern gallery and auditorium space of 24,500 square feet added in 1990. SECCA is committed to showcasing the country’s major contemporary artists while still maintaining their commitment to Southern artists. Which art galleries in Winston-Salem are your favorites and why? Added! It’s a wonderful gallery space. Thanks so much!